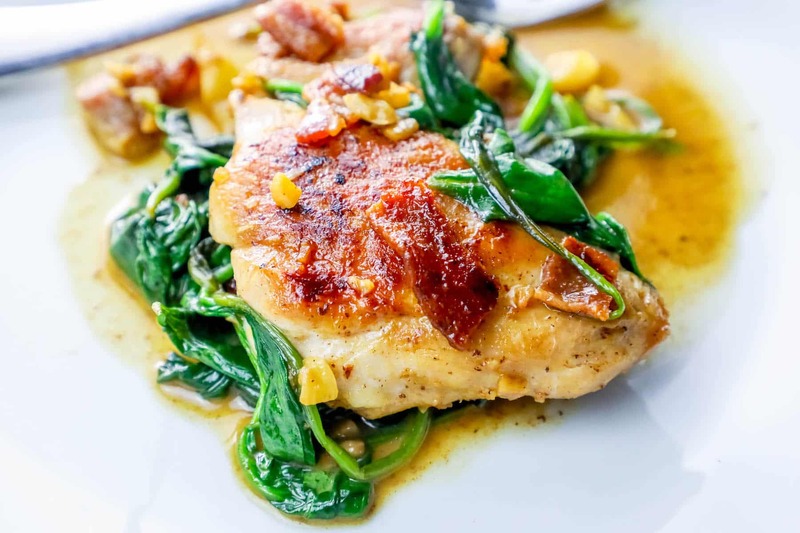 One Pot Bacon Garlic Chicken and Spinach Dinner is a delicious, savory, rich, and luxurious complete meal in just one pot and under 20 minutes! Is there any greater combination in all of history? Ok – maybe a house all to myself, red wine, and Russian Snickers (they taste totally different when made with hazelnuts instead of peanuts, I’m forever spoiled….) – but I digress. 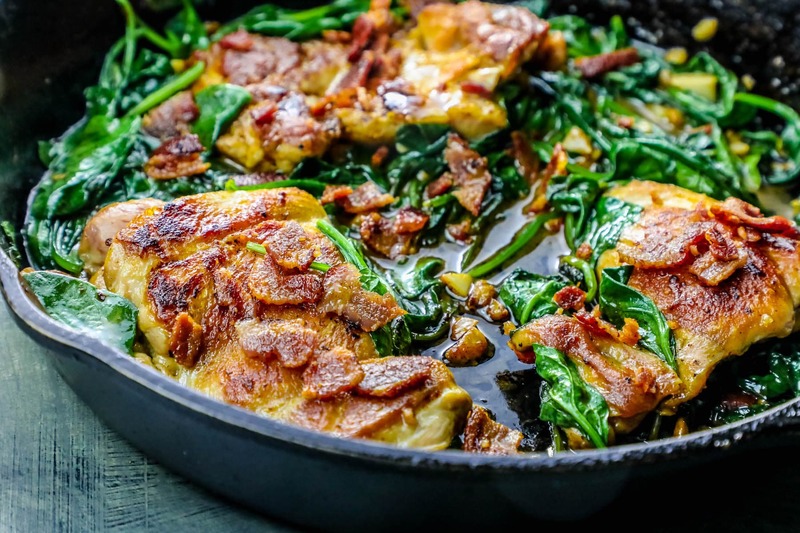 If you have chicken, bacon, and spinach – along with some garlic and butter on hand, you can have an amazingly delicious, restaurant-quality dinner in no time – in just one pot! 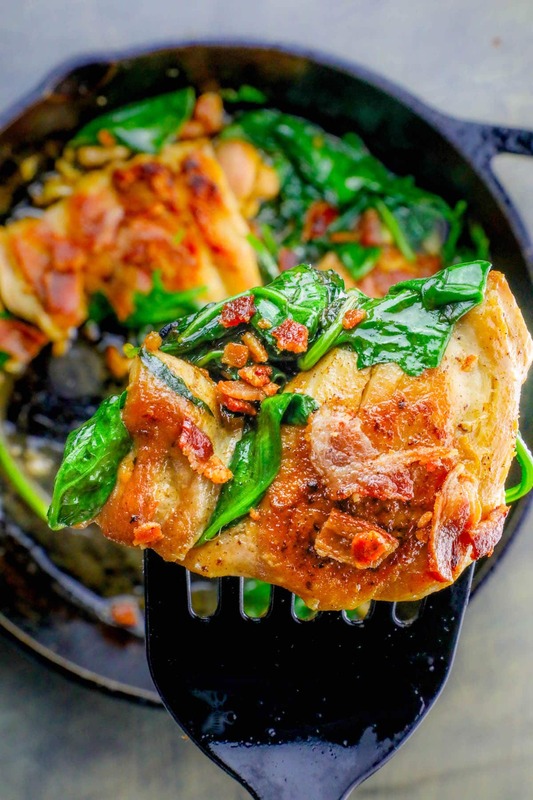 This one pot bacon garlic chicken and spinach dinner is completely drool-worthy, and will become a family favorite in just one sitting! The meal is super-simple, great for dinner parties (serve with rice, potatoes, or cous cous for a delicious and easy spread that will wow your guests) – and in just one pot there is little cleanup! 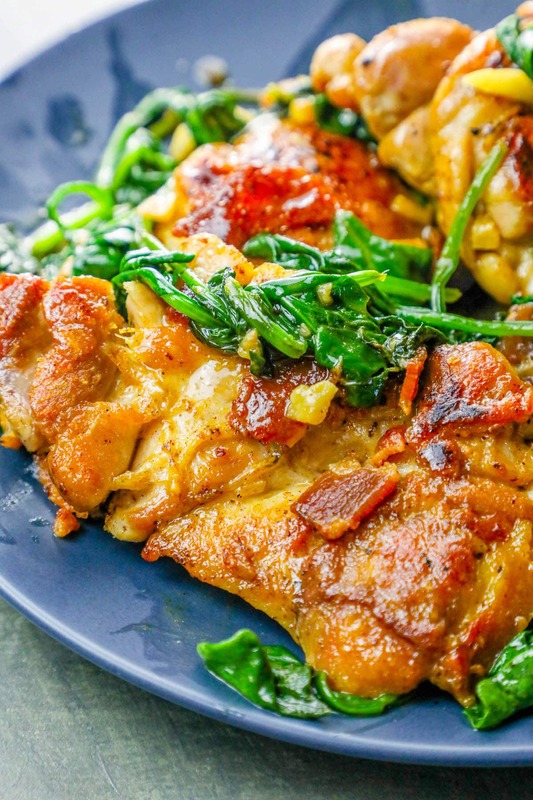 I have a go-to method for cooking chicken thighs that is slightly different than how I see a lot of bloggers cook chicken thighs – I lay them out flat when cooking if they are boneless. 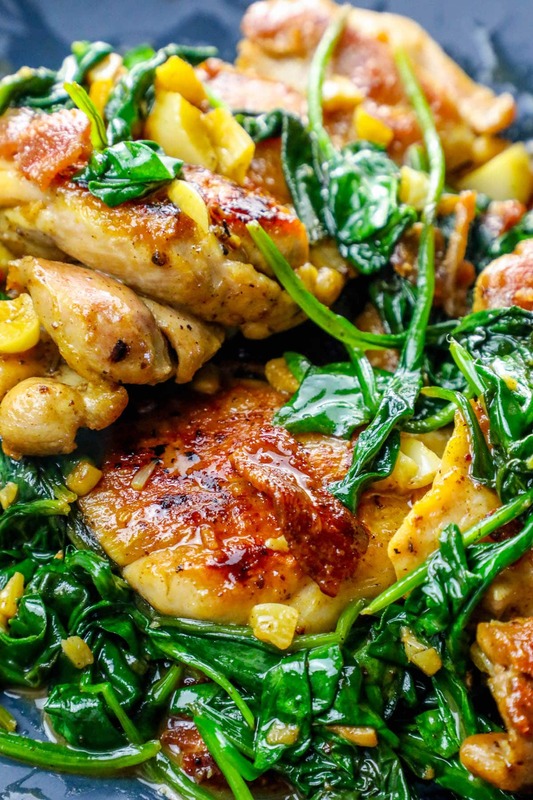 The chicken thighs look a bit weird when unrolled, but laying them flat, especially when pan frying, makes the fat render out and makes the chicken thighs lose the typical “flabby” texture a lot of people hate in chicken thighs! Since thighs have a lot more fat than breasts, they don’t dry out as easily, making them foolproof when pan-frying. 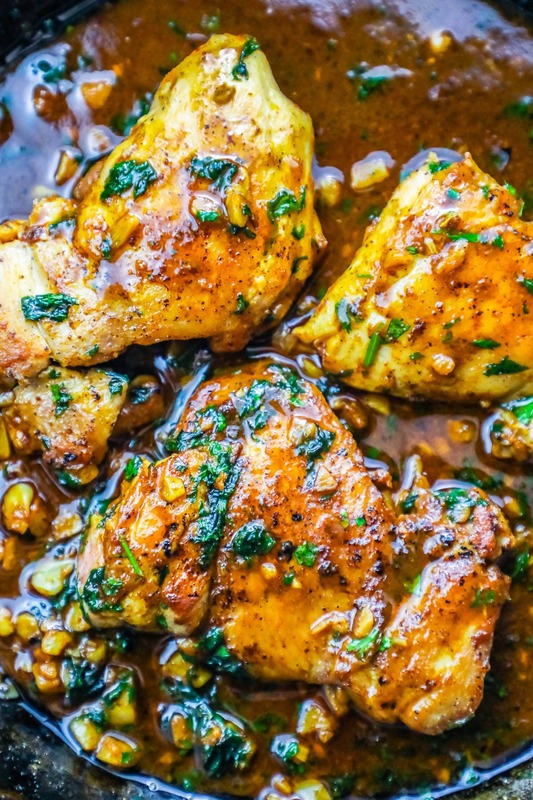 Even though my secret for making drool-worthy chicken thighs is pretty fool-proof (and makes the texture and flavor of the thighs a lot more palatable for people who don’t love thighs), you can easily make some simple swaps for this recipe! 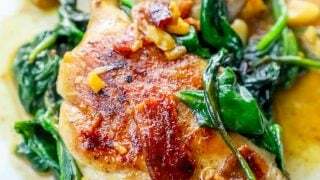 If you’d rather use chicken breasts, butterfly the breasts (to make two thin chicken breasts) – and then if they are large breasts, cut them in half again (to make 4 smaller chicken breasts – not strips, but smaller breasts). 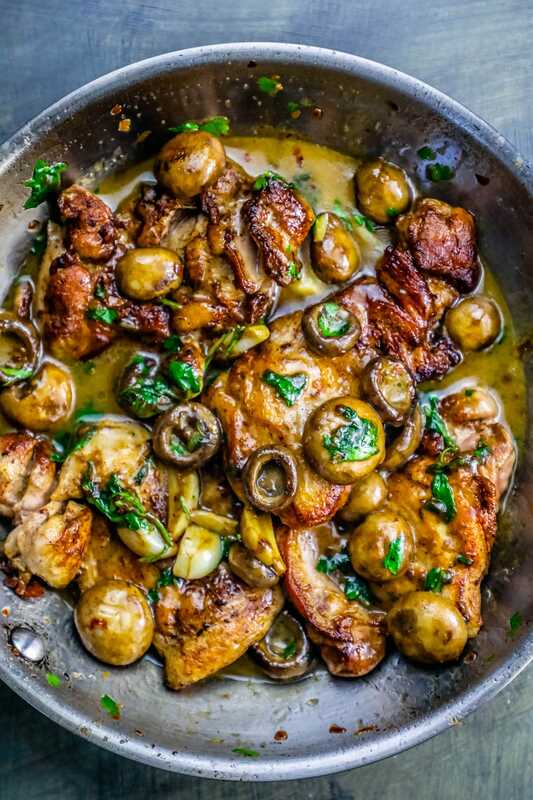 If you’d rather try this recipe with pork, swap the chicken thighs for thin cut pork chops, with or without the bone. The flavor will be amazing – but reduce cooktime to just brown the chops, and then cook to 145 degrees internal instead of 165. 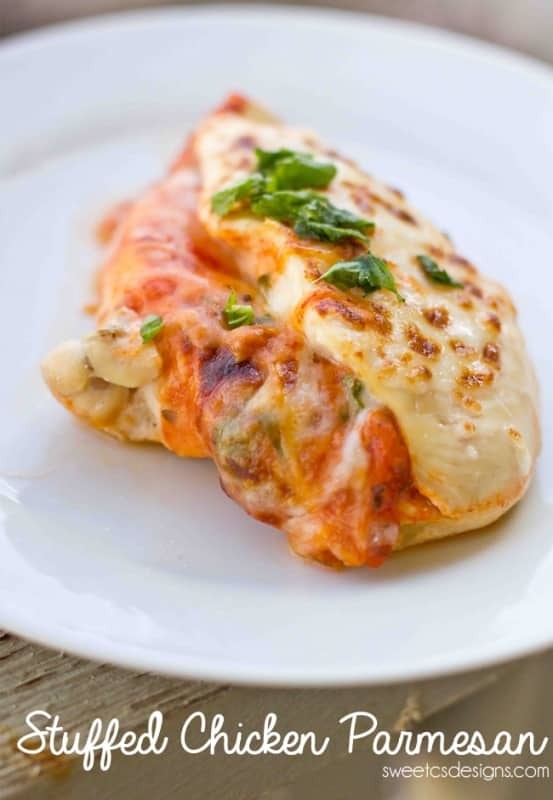 This recipe is amazing with shrimp instead of chicken – simply skip where you’d brown the chicken, and add the garlic and butter right after crisping the bacon instead. Then, when you add the rest of the stock to form a sauce, add the shrimp and spinach so they don’t overcook! When shrimp is opaque, they are done. 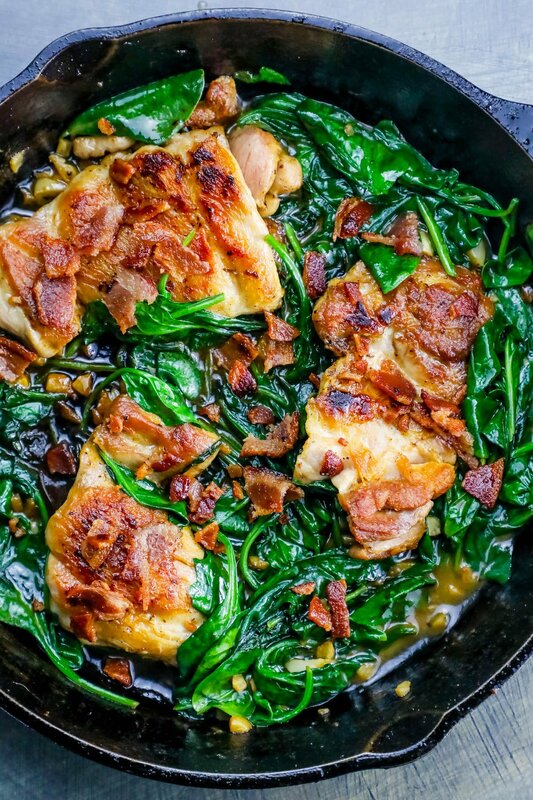 If you love this delicious, easy one pot bacon garlic chicken with spinach, you’ll love these other easy one-pot dinners! To watch me make this recipe, click the video below! 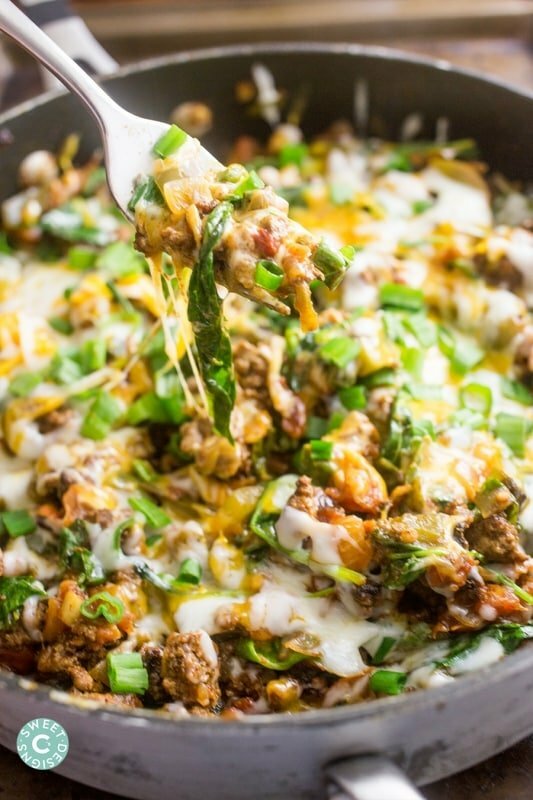 If you love this recipe, please help me share it on facebook (there is a link you can share directly at the bottom of this post) and share on pinterest! 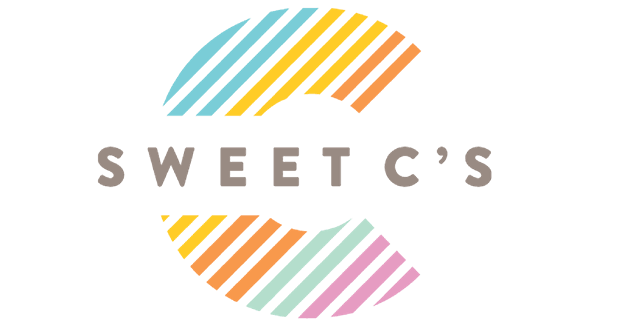 This helps me make more recipes and share them with you 100% FREE! You can also sign up for my totally free (and spam-free) newsletter where you’ll get the best recipes, travel ideas, and tips for an effortlessly elegant life right to your email! Click to sign up here. In a large, heavy pan, cook and crisp bacon until well browned. Remove bacon from pan, do not drain grease, and set aside and crumble when cool (while chicken is cooking). Add chicken thighs to pan (I like to lay them flat to crisp up more and let the fat render). Let brown on each side, about 4-6 minutes. Add butter to pan, let melt. Add garlic to pan, let brown, about 4 minutes. Make sure garlic does not burn. Add stock to pan, and then add chicken thighs back in. Cook until stock has reduced into a thicker sauce and chicken has reached internal temperature of 165 degrees - about 5 minutes. Add spinach, toss with chicken and sauce, and let reduce. Sprinkle crumbled bacon over the top. 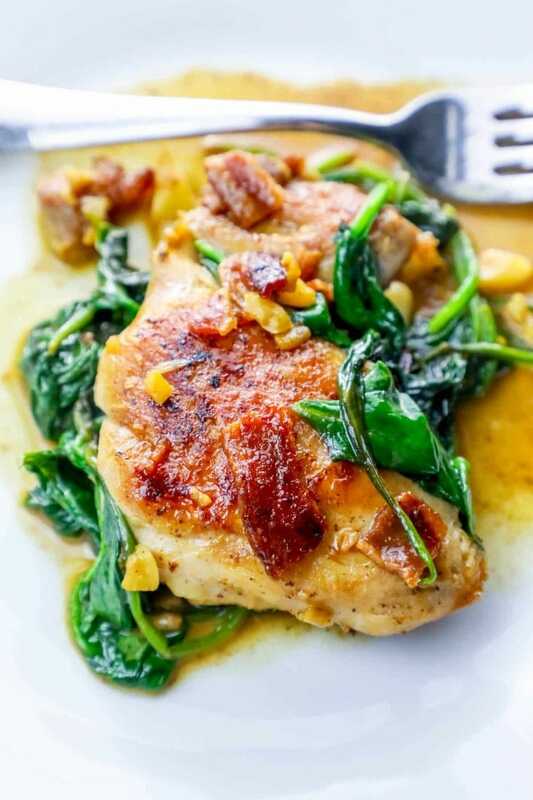 When spinach is soft and reduced, remove from heat and serve! Can you sub pork bacon for turkey bacon??? If you like the flavor of turkey bacon, absolutely! I made this tonight. It was easy, quick, and delicious! I put it over quinoa. I will be checking out more of your recipes. So glad I came across your recipe! It was fantastic. Next time we make it, however, we’ll serve over orzo to soak up the garlic-butter sauce/liquid. Can’t wait! This is absolutely delicious! I’ve passed this on to many and everyone is a huge fan. Quick and easy, I just recommend a splatter screen for the bacon grease bc I can never control that mess, haha.